Editor’s Note: This post is part of a series highlighting cause marketing campaigns from around the world called ‘Global Voices’ and brought to you by Your Public Interest Registry. We hope our team of international contributors will shed insights into cause marketing in their home country and inspire you to expand your own purpose-driven horizons. 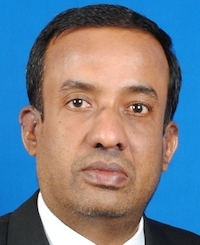 Ashok Prasad is a marketing communication professional from India. Tiger conservation, toilet construction, children’s education, planting trees, drinking water in schools and solar power in villages – there is no paucity of causes for which brands are seeking support or donations from consumers in India. While some of these cause marketing efforts have been running for years, several new ones have started recently. Aircel and NDTV recently announced the third season of their Save Our Tiger campaign to collect funds for tiger conservation, after its successful run during 2010 and 2012. Unilever’s Domex Toilet Academy (DTA) campaign which started in 2013, seeks to build 24,000 toilets by 2015 in areas facing the problem of open defecation. 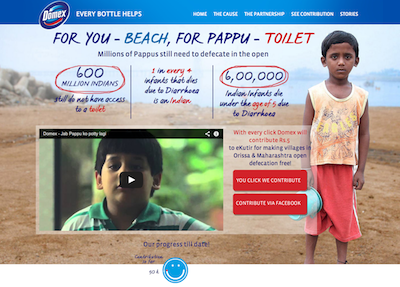 For every consumer who clicks on the DTA website, Unilever contributes 5 Rupees (8 cents) towards the construction of toilets. This big push from Indian marketers towards cause marketing reflects several global consumer research studies indicating that the Indian consumers are among the most environmentally and socially conscious in the world. In the National Geographic Globescan Greendex Survey, which measured the environmental sustainability of consumption across 17 countries, the Indian consumers obtained the highest Greendex score. This survey also says that Indian consumers feel the highest levels of personal guilt about the environment with 45% of them admitting to feeling bad about their impact compared with a global average of 28%. The Edelman Good Purpose Study conducted across 16 countries suggests that 71% of Indian consumers (compared with a global average of 43%), are willing to pay a premium to purchase products which support causes. And the Nielsen Global Socially Conscious consumer report also indicates that the Indian consumers score the highest on the willingness to spend more on products from socially responsible companies. While these surveys reveal the socio-environmental consciousness of some Indian consumers, the other key trigger for cause marketers is the huge numbers of the emerging Indian middle class. While a conservative estimate from the Center for Global Development indicates a size of 70 million for the global middle class in India, estimates from others such as McKinsey project the Indian middle class population at 250 million in 2015. This would make the Indian middle class equivalent in size to the total population of UK, France, Germany and Spain combined. A large target audience implies that it is easier to obtain a minimum threshold of response for the cause marketing efforts. Health and hygiene: typical examples are the Unilever’s Lifebuoy hand wash campaign which focuses on the role of hand washing to enable a child to reach the age of five and the Domex Toilet Academy. Education: P&G’s Shiksha seeks to provide funds to build infrastructure in rural schools and Coca-Cola’s Support my School initiative. Ecology and environment: this includes Toyota’s Greenathon, a campaign to create environmental awareness; Aircel’s Save Our Tiger campaign; and Unilever’s Kissanpur initiative to encourage children in the cities to grow tomatoes. Water: Kent water purifier’s Saaf Pani Swastha Bharat (Clean Water, Healthy India) initiative and Killer ‘water saver’ jeans TV commercial which highlights the green side. While the budgets for most of these initiatives have possibly come from the brand allocations, the new government guidelines on the mandatory spend of 2% of profit on corporate social responsibility activities by larger companies is likely to boost the funds available. The popularity of these cause campaigns is quite evident with the large number of Facebook fans for some of these initiatives. 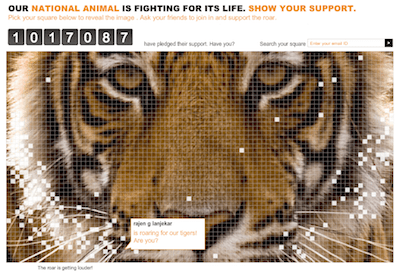 Save the Tiger facebook page, for example, has over 2.3 million fans, while causes.com and Being Human each have over 1 million facebook fans in India. These numbers indicate that the Indian consumers are now more than willing to engage in positive action to be a part of the solution for these causes. While the large Indian middle class offer a ready target audience for these cause marketing efforts, the huge number of Indians who continue to live in poverty shows that there are many more causes that need to be addressed by such campaigns. The official Indian government figures indicate that 269 million Indians are living below the official poverty line, but the latest World Bank data suggests that 400 million Indians live in poverty. Most of these Indians still lack access to drinking water, sanitation, education, proper nutrition, medical facilities and weather-proof housing. Its time more Indian marketers joined the cause to strengthen the efforts that are already underway.